Sometimes I can interpret a band and make a decision about them after only listening to a few songs. Such is the case with Shadowside, a strong and potentially formidable female fronted metal band from Brazil. 'Dare To Dream' is their second full-length release and boasts some fine credentials: recorded, produced and mixed by Dave Schiffman (Audioslave, System of a Down, Red Hot Chili Peppers) and mastered by Howie Weinberg (Iron Maiden, Metallica, Pantera, Rush, Aerosmith). As for the band and music, it's rather easily explained. 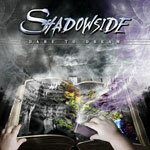 Shadowside delivers heavy metal with the catchy flavor of melodic hard rock. The vocals are handled by Dani Nolden, but don't think the whole symphonic/gothic thing here; Ms. Nolden is metal, all leather and certainly no lace. Her voice is strong and impressive. It also caused me to want to get through 'Dare To Dream' as quickly as possible. Don't get wrong here: Ms. Nolden is probably better than 50 percent of her male counterparts in the strength of her delivery; she can scream with the best, I'm quite confident. However, that seemed to be my dilemma: all she did was wail and when she did it sounded strained or more often flat. I grew weary of it after three songs. Even the ballad 'Time To Say Goodbye, though good, showed her poise but little variation. Overall, Shadowside impressed me as a solid and creative heavy metal band in the more traditional style, despite my skepticism of Dani Nolden's vocals. Unfortunately, the latter will probably cause me not to reach for 'Dare To Dream' too often or anytime in the near future. Shadowside impressed me as a solid and creative heavy metal band in the more traditional style, despite my skepticism of Dani Nolden's vocals. Unfortunately, the latter will probably cause me not to reach for 'Dare To Dream' too often or anytime in the near future.